TelzeyTalks: Nine Time Travels: What About That Ending? Nine Time Travels: What About That Ending? There are a lot of theories about the ending scene of Nine Time Travels, all conflicting, and none quite encompassing all of the issues. My opinion: it is a metaphor of the whole story, and not meant to be taken as a scene in the timeline. Why do I think that? Because the story is presented to us as a fantasy right from the start. It begins in episode 1 with a sweeping view of the mountains of Middle Earth and an accompaniment of the Lord of the Rings style music, complete with epic elf chorus and ethnic hobbit flute. Why do I think that? Because the brothers are shown on high mountain slopes, nowhere near anywhere they belonged. In Asia nature is thought to uplift and purify the soul, purification being difficult. High mountains are particularly sacred places. White is the color of mourning. And snow not only indicates the hardships of winter, but in a contradictory way, since snow obscures all surroundings and transforms it into something new and different, it represents life-transforming experiences. Why do I think that? 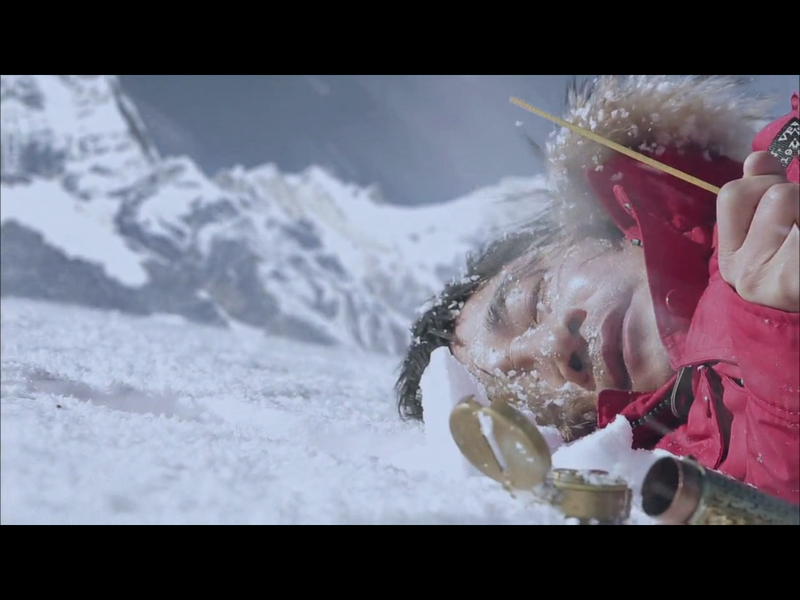 Because of the close-up of the older brother, Jung-woo, lying in the snow with his compass and the open incense case on the ground in front of him. The case is empty, and he has one stick in his hand. This doesn't fit into the story anywhere. Jung-woo never had the case, and if he did he would not have wandered around the mountain trying to light the last incense stick. Yet this scene is shown in the beginning of the first episode as well as at the end of the last episode, over the closing credits. He has dropped the compass, representing how lost he is. And since the younger brother, Sun-woo, tells us in episode 19 that the incense is the fruit of knowledge, the empty case symbolizes Jung-woo searching for knowledge and not being able to find it. In episode 1, we see a shadow fall on Jung-woo's face, so we know there is someone else around to prevent him from dying in the snow. That proves this scene doesn't fit into the rest of episode 1, because Jung-woo dies there. In episode 20, that person turns out to be Sun-woo. He holds out his hand to his brother and pulls him up. There you are. This whole story is about Sun-woo trying to save his brother who is lost, and we certainly hope it worked. It fits in with all the symbolism that occurs throughout the show. In episode 1 when Sun-woo lights that first incense stick and lies down to rest, he suddenly finds himself outside in the dark in a flurry of snow. But the incense stick goes out and he is back in his hotel room by the time he stands up. This is not a normal time travel. He should have been in the hotel room of exactly twenty years ago, or at least in the town if the hotel hadn't been built yet. The town is in summer, with green growing things. The incense took him to a blizzard, a reminder to us of the snow in the opening scene, and a warning to him. The picture of Min-young in her fur-lined parka, that shows up on Sun-woo's phone all through the show, is a instance of this. It shows up in all timelines, even before the picture could have been taken. Child and woman, she's known him in all the timelines. In the last episode Sun-woo says that she is the key, and this illustrates that. The whole thing is a fantasy anyway. Sun-woo sends a message to his friend, Dr. Han, at the end of episode 3, "Believe in the fantasies you want to believe." This phrase gets repeated several times during the drama. In the last episode, when he is on the plane, he reviews to himself, "Perhaps this is what happened: I made a big impression on Min-young so she fell in love with me at once. And I became a reporter because of the connection in the past. If that's true, I can save you [his future self] and prevent Min-young from being unhappy because of me." Then the subtitles read: "But that's not true." But if you listen to the words, he says, "Krum, fantastiche." So what he really said was: "Then that's a fantasy." In episode 5 Dr. Han asks, "How is it possible?" Sun-woo replies, "It's pointless to ask that. None of it is possible." However, we are going to a lot of trouble trying to figure things out, and we want it to make sense. In episode 9 I started noticing the mirrors. There may have been some before, and there were certainly a lot of them afterwards. All of the major characters are seen reflected in mirrors. In this episode the parallel function of the two timelines of 1993 and 2013 is highlighted with mirroring scenes such as young and adult Dr. Hans running down halls and up streets to find injured Sun-woos. An important scene in episode 20 shows Sun-woo, changing back and forth to adult and teen versions, reflected in a mirror. He recognizes himself and knows he's been caught up in different timelines. Perhaps all the mirrors are showing that the people are caught this way. In episode 16 after the incense disappears from Dr. Han's hand, he has a theory that it happened because Jung-woo died. Sun-woo disagrees; he says it was caused by a time change. He turns out to be right (the housekeeper took the incense), so we can believe his analyses after this. In episode 19 when he says,"I think I know why I can't go back. The incense is me. I used all of the incense sticks and my role is over," we can take it that he is right. Did the Present6 timeline extinguish when Sun-woo died? We are all haunted by the idea that everyone lived their lives mourning his loss. Well, in episode 9 the timeline didn't change when he died on the operating table. It changed because of an event in the past that caused a new timeline: young Dr. Han finding the cancer pills and deciding to make Sun-woo get regular check-ups. This did not create two concurrent present timelines. The old one dissolved in smoke and the new one began, or rather, continued from the actuating event in the past. In the same way, when he dies in the phone booth any change in the present timeline has to be caused by an event in the past. Sun-woo's watch shows 8:07 when he dies on April 24, 1993. Dr. Han and Min-young have 2013 scenes at 8:00 pm so the Present6 timeline could have ended any time after that. At 8:07 pm on April 24, 2013, adult Min-young remembers (exactly 20 years later) seeing the man in the crashed-in phone booth when she was a child and making a pinky promise. That is the actuating event, and that is the point at which the Present6 timeline extinguishes. She grew up in Past7 remembering that event and avoided Sun-woo for quite a while. She was indeed the key to his future, because when she told him about the man who looked liked him, he resolved to not use any incense. He couldn't have used it in any case, because it had already been used and we've seen that you can't use it again. Even if Jung-woo goes wandering around the mountains, Sun-woo will just have to find him that same day. He's been wearing beard stubble quite a bit anyway; growing a beard will be nothing.